After shooting India to glory, Abhinav Bindra today hoped that the first individual Olympic gold medal of the country will inspire other sportspersons to achieve more laurels in international events. If there is one person who should get credit for Chandigarh’s Abhinav Bindra shooting gold at the Beijing Olympics it is his father, A.S. Bindra, a food technologist and an industrialist, who for more than a decade had backed his son to the hilt. Milkha Singh: It was my wish to see any Indian coming home with gold medal in an individual event. With his tremendous achievement, which cannot be described in words, this young boy has realized my dream. The gold medal, which slipped from my hands during the Rome Olympics in 1960, is back. India's World Cup winning captain and cricketing legend Kapil Dev Monday termed Abhinav Bindra's gold winning feat as the biggest sporting achievement of the country. Kapil said winning country's first individual Olympic gold is a far bigger achievement than the 1983 cricket World Cup triumph. Ace Indian shuttler Saina Nehwal pulled the rug from under world number five Wang Chen's feet to shuttle into the quarterfinals of the women's singles event at the Beijing Olympics here today. An inconsolable Sania Mirza left the court in tears after her singles campaign ended in just 46 minutes with a wrist injury forcing her to retire in the first round at the Olympic Green Tennis Centre here today. India celebrated their first individual Olympic gold medal on Monday and American swimmers kept Michael Phelps's dream alive by a finger-tip. The usually cool Phelps screamed and pumped the air with joy as his U.S. team mates helped maintain his charge for an unprecedented eight golds in the pool, pipping France in the 4x100 metres freestyle relay. So the inevitable has occurred. India capitulated by eight wickets in the third test against Sri Lanka to yield the series 2-1. 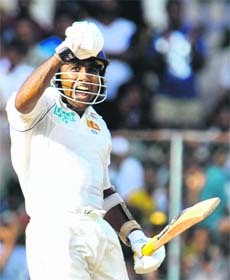 It highlighted that Sri Lanka, who have never won a Test in India, remain a force to be reckoned with at home. Kevin Pietersen celebrated his first Test as England captain with a consolation six-wicket victory over South Africa in the fourth and final Test on Monday. Andrew Flintoff (11 not out) hit the winning runs with a straight six as he and Paul Collingwood (25 not out) steered the home side to 198 for four. The second edition of the Asian Football Confederation (AFC) Challenge Cup final will be played at the Ambedkar Stadium here on Wednesday, 13th August, at 7 p m. ESPN Star Sports will telecast the match live. Legendary US swimmer Mark Spitz won't be on hand in Beijing if Michael Phelps breaks his record of seven gold medals at a single Olympics - because, he says, no one bothered to invite him. Spitz said the International Olympic Committee, a US television network or FINA - the international body that governs world swimming - should have brought him to the Games this year, with Phelps making a go at his record. "I never got invited. You don't go to the Olympics just to say, I am going to go. Especially because of who I am," Spitz told AFP in Hong Kong. Chinese police and military are frightening tourists with a ''stone face'' at the Beijing Games and should smile more, a senior International Olympic Committee (IOC) member was quoted as saying on Monday. Norwegian Gerhard Heiberg, chairman of the IOC's marketing commission, said he had taken the matter up with Chinese officials and urged a happier and more welcoming attitude. ''The Chinese are scaring the wits out of foreigners. Australia's most prolific world record breaker, former Olympian and Gold Coast mayor Ron Clarke, has criticised the Beijing Olympic opening ceremony for being "too robotic" and extravagant. One of the world's most accomplished long distance runners, Clarke has attended 20 Olympic opening ceremonies since 1956. He said Beijing Olympics opening ceremony was spectacular, but lacked soul. Azerbaijan's Elnur Mammadli needed 13 secs to beat teenage world champ Wang Kichun of S. Korea to win men's 73 kg category and emerge as his country's first Olympic judo champion. 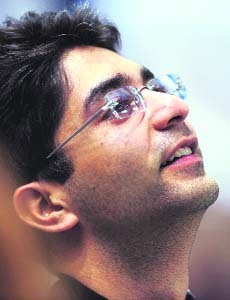 Abhinav Bindra looks up at the scoreboard as he wins the men's 10m air rifle shooting competition at the Beijing 2008 Olympic Games on Monday. "For me life will go on. I sincerely hope that it changes how Olympic sports is viewed in India. Right now Olympic sports don't seem to be priority and I hope it will change now. As for shooting, I am sure it will grow stronger from here," said Bindra. Bindra came up with a near perfect 10.8 in his final shot during the final at the Beijing Shooting Range Hall to give the country its first Olympic gold 28 years after the men's hockey team emerged champion in the Moscow Olympics, 1980. Bindra, who qualified for the final as the fourth best with 596 points, who shot the best series of final 10 shots for 104.5 to boost his total to 700.5 on way to a golden finish. The defending champion Zhu Qinan of China had to be content with the silver, and broke into tears after losing on his home turf. Zhu totalled 699.7 with 597 in qualification and 102.7 in the final. Left clutching the bronze was Finnish armyman Henri Hakkinen, who had led the qualification with a brilliant 598. In the final he came a cropper with 101.4 and it was the last shot of 9.7 that precisely did him in. Going into the final, two points behind the Finnish armyman, Henri Hakkinen, Bindra said he was focussed on the job at hand. "I wasn't thinking about history. I was lying two points behind the leader. I just wanted to shoot and I wanted to shoot aggressively and that's what I did." "I just went for it. I knew I was lying fourth before the final. I started my sighting on a very poor note. Thankfully, after that it went my way and I kept going. I am lucky that it went my way." There was a time after the Athens Olympics when Bindra had such a severe back problem that he had even considered whether to continue with the sport. But the Zagreb World Championship gold medal got him going again. If there is one person who should get credit for Chandigarh’s Abhinav Bindra shooting gold at the Beijing Olympics it is his father, A.S. Bindra, a food technologist and an industrialist, who for more than a decade had backed his son to the hilt. He was the first person who sensed that his son had it in him to give the country its first individual gold in the Olympics. The senior Bindra ensured the best weapons money could buy, the best coaching and the best foreign exposure for Abhinav, even when there was no back-up from the government. Nothing was left to chance. The senior Bindra planned his son’s career to the last minute. And the son gladly followed, never questioning the regimentation he was put through. And this was probably the principal reason why on Monday morning Abhinav showed no nerves as he took aim at the Beijing Olympic Games. When Abhinav stood on the victory dais one could see the calm on his face. And in his heart of hearts he must have known that what he had achieved was all due to his father and the unstinted support of his family. Among the first calls I received in the morning was from one of the shooting coaches of the Indian contingent in Beijing, T.S. Dhillon, a top IPS officer currently posted in Assam, who was ecstatic. He said this Chandigarh lad had done the country proud. Dhillon, who was earlier posted in Punjab, had watched Abhinav’s progress over the years and knew about all the hard work the bespectacled shooter had put in. I first met Abhinav shortly after he became the national champion in the .177 ISSF category in 1998. Still in school he resided in Chandigarh’s Sector 32. And even then at the age of 15 Abhinav seemed very focused. For him the national championship was just a stepping stone to bigger laurels. His father had built a range in their house where he practised for hours. A quiet lad, Abhinav spoke very softly but even at that young age he seemed to know what was expected of him, both by his family and by the nation. Over the years Abhinav was given all that was necessary for becoming the best in the world. The family chipped in with everything possible to make the country’s dream come true. Way back in 2001 Abhinav spent about Rs 117 lakh for his quest for excellence. And the money spent must have grown over the years. Very few know that besides expenses on specialised coaching (Abhinav has a personal coach), money had to be spent on mental management, travelling and weapons specially manufactured for him by a gunmaker in Germany, where Abhinav goes a couple of times every year for adjustments. 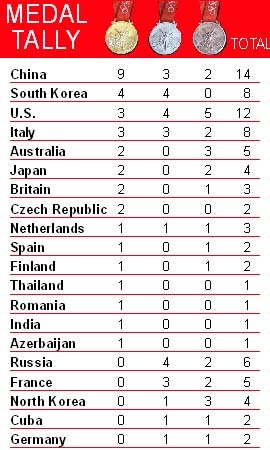 Compared to the peanuts, which Indian sportspersons receive for training for the Olympics, nations like the USA, Germany and China earmark about $ 3 million per Olympic span (four years) to prepare shooters for any Games. For those who do not know, shooting is a very lonely sport. There is no support system, neither are their any spectators to egg you on. Most of the time a shooter is competing against himself. And to do so day after day requires a very strong character. And this has been amply proved by Abhinav who has trained abroad year after year in his quest of the gold. Beijing is the third Olympic Games that Abhinav is taking part in. And being just 25 he can hope for many more Olympics in the future as well. Milkha Singh: It was my wish to see any Indian coming home with gold medal in an individual event. With his tremendous achievement, which cannot be described in words, this young boy has realized my dream. The gold medal, which slipped from my hands during the Rome Olympics in 1960, is back. I firstly congratulate his parents, who gave birth to such a shining son then I gave credit to the coach J.S. Dhillon. I will request the Prime Minister to confer Bharat Ratna to this young shooter, which he deserves thoroughly. Balbir Singh Senior: With dedication, mental toughness, determination, and consistency in practice, Abhinav has not only created a history but also held our heads high. I am very happy and celebrating the occasion. My heartiest congratulations to the parents and the family for making all of us proud. With his feat, Abhinav has opened the doors to all individual events. Pargat Singh: This is the biggest as well as the rarest moment, which every Indian had been waiting for. As Abhinav belongs to the ‘City Beautiful’, one can well imagine our happiness. The feat will not only boost the morale of all the sportspersons but also change the sports scenario in the country. We all are proud of Abhinav. Harmeek Singh: This is biggest surprise we have today. Bringing individual gold medal in Olympics is the greatest honour for the country. Earlier, we had gold medals but all came in hockey; a team event. Abhinav has proved that nothing is impossible if one has determination, grit and dedication. Like every Indian, I too, am feeling proud and congratulate Abhinav and his family on this great occasion. The time has come for the government to encourage all sports disciplines, top ensure that such feats can become routine matter for us. Vasudevan Baskaran, who had led India win its last Olympic gold in hockey in 1980 Moscow edition, described shooter Abhinav Bindra's feat as better than his team's effort 28 years ago. "It's a great day in the history of Indian sports. Finally, we have won an individual gold. (The) youth in the country have got a new icon in Abhinav," said Kalmadi. India's World Cup winning captain and cricketing legend Kapil Dev Monday termed Abhinav Bindra's gold winning feat as the biggest sporting achievement of the country. Kapil said winning country's first individual Olympic gold is a far bigger achievement than the 1983 cricket World Cup triumph. The former-all-rounder also hoped that the feat would have the same effect in India's sporting scene as the 83' world cup win had on popularity of cricket. "Bindra has done the country proud. This is far bigger than any other sporting achievement. It is difficult to compare India's sporting laurels but I think this one has eclipsed all other feats," Kapil said. "It is very difficult for any Indian sportsperson to win medals in international competition, leave alone Olympics. Because they have to perform under pressure and with no resources available. It is against heavy odds. Bindra's effort will inspire others to win more laurels. They will do much better in times to come." India's one-day captain Mahendra Singh Dhoni said he would like to congratulate Binda personally. Saina, a dark horse here, delivered on her pre-Olympic promise to scalp a few higher ranked players and came up with a sublime performance to tame her illustrious opponent from Hong Kong 21-19, 11-21, 21-11 in 52 minutes to reach the last eight stage. In the quarterfinals, Saina meets Maria Kristin Yulianti, who is world number 16 and was part of Indonesia's Uber Cup runners-up team. Saina's quarterfinal encounter is expected to be a mouth-watering contest as Yulianti too looked in good form after edging out sixth seed Tine Rasmussen 18-21, 21-19, 21-14 in an hour-long gruelling battle. Saina today proved why she is a force to reckon with in the badminton court as she seized early initiative, withstood a setback before delivering the knockout punch to upstage fourth seed Wang. With two quality shuttlers engaged in a no-holds-barred battle, lead kept changing in the first game and Saina, trailing 16-19 looked in trouble before she reeled out five points on the trot to leave Wang stranded. In the second game, both were levelled at 7-7 when Wang broke loose and won 10 of the next 12 points to stretch her lead to the point of being virtually unassailable and it was too late for the catch up job for Saina. With the match stretched to the decider, Saina decided break loose and won the first six points before made a comeback of sorts, though she was still trailing 4-7. Saina responded by winning the next five points in a row to widen the gap and maintained her lead with an iron fist to walk away with a win. The 18-year-old Indian ranked 15 in the world, was also helped by a high number of unforced errors from Wang in the decider. Saina was also immaculate with her drops and elegant with her placements. Shuttler Anup Sridhar's Olympic campaign did not proceed beyond the second round as Shoji Sato of Japan sent the Indian packing in straight sets at the Beijing University of Technology Gymnasium here this evening. 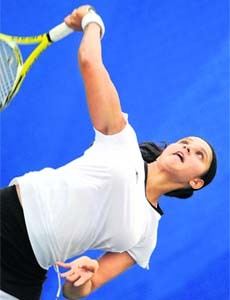 Sania Mirza serves to Iveta Benesova of the Czech Republic during their first round match in Beijing on Monday. Sania, returned into the game after a three-month lay-off following a wrist surgery, was trailing 1-6, 1-2 against Czech Iveta Benesova when she decided to concede the match. The injury also casts a cloud of doubt over her availability for tomorrow's doubles first round match. The Indian scratch pair of Sania and Sunitha Rao is scheduled to meet the French pair of Tatiana Golovin and Pauline Permentier in the opening round here tomorrow. "She had a surgery on her right wrist and it was bothering her right from the beginning. She was covering the court well and keeping the ball in play too. But things subsequently became too painful and she had to retire," team coach Nandan Bal said. Against the left-handed Czech, Sania had a disastrous start as she dropped the first game and could not hold her serve in the third and seventh as well as Benesova, who never lost to Sania in their previous three meetings, wrapped up the first set in 32 minutes. Sania began the second set with renewed vigour, breaking the Czech in the opening game but Benesova broke back to settle score and held her serve to lead 2-1 when Sania threw in the towel. A.L. Lakra paid the price of being too cautious as he crashed out of the boxing competition after losing 5-9 to Athens Games bronze medallist Bahodirjon Sultanov in the opening round of the featherweight category here today. 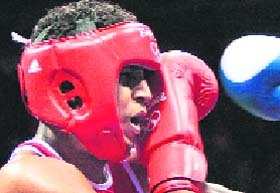 Lakra, the only Indian boxer in action today, evaded too much and attacked too little against an aggressive Sultanov in the low-scoring bout. The first round had the Indian trailing 1-2 and the margin remained the same at the end of the second round with Lakra 3-4 behind. Sultanov, a bantam weight bronze winner in Athens, relied on jabs and right crosses to unsettle Lakra and succeeded without much hassle as the Indian failed to take advantage of his long reach. Lakra did make it 5-5 in the third round but Sultanov ensured that it was to be the only highlight of the bout for Lakra. The Uzbek pugilist launched an aggressive assault in the final round and raced to a four-point lead before ending Lakra's hopes. Lakra was gracious in defeat and said he always knew that Sultanov would prove to be a tough opponent. "I knew he is a good fighter. He was better than me but I did well enough to convince myself that I can beat him in future," he said. "The fourth round didn't go my way and he came up with a good punch that affected my rhythm. It cost me a lot," he added. India’s Nachhatar Singh Johal remained with the rear pack in the 23rd position among 26 competitors after six races in the sailing event of the Beijing Olympics on Monday. Johal has so far conceded 86 net penalty points and was only ahead of the Czech Republic’s Michael Maier (95), Peng Zhang (97) of China and Venezuela’s Senen Bilbao (111). Two races were held on Monday, with Johal putting up an improved performance in race 5 where he gave 11 penalty points to take the fifth spot after starting from the Qingdao Olympic Sailing Centre. But the Indian failed to retain the momentum in race six where he gave as many as 24 penalty points to find himself in the 24th slot. Ben Ainslie of Great Britain was in the lead, having conceded 17 penalty points. Rehan Poncha today earned the distinction of swimming in the Olympic pool in the same event in which world record holder Michael Phelps (USA) also participated but that was all the Indian had to show as he got lost in the crowded field in the 200m butterfly to finish 40th in the total field of 44 here this evening. The 22-year-old had no illusions about his prospects in Beijing because he is here to train for the 2012 London Olympics, but in the process, he even failed to improve upon his own record or even equal that. Poncha was allotted heat one along with three other swimmers and the Indian timed 2:01.89 which was below his best of 2:01.40s and was placed second. He clocked 27.47 for his first 50m, he added 30.32s while crossing another 50m (57.79), his next 50m took 31.52 s (1:29.31) and he ended the last lap in 32.58. Gagan Narang narrowly missed getting into the eight-man final of the 10m air rifle event as he finished ninth in qualifications despite tying for fifth place with four others at 595. The others moved up as Narang lost out on countback. Earlier in the qualification round, Gagan Narang, despite a perfect 100 in his last series, was edged out of the final on a countback. With Hakkinen at top with 598 and Qinan at 597, Bindra and Ain George Moldoveanu of Romania had 596 each. India celebrated their first individual Olympic gold medal on Monday and American swimmers kept Michael Phelps's dream alive by a finger-tip. The usually cool Phelps screamed and pumped the air with joy as his U.S. team mates helped maintain his charge for an unprecedented eight golds in the pool, pipping France in the 4x100 metres freestyle relay. Indians banged drums and danced in the streets after the world's second most populous nation won their first individual Olympic title with Abhinav Bindra's gold in the men's 10m air rifle. A familiar shadow fell over the Games when a Spanish cyclist became the first competitor to fail a drugs test in China. Maria Isabel Moreno was caught taking the endurance-boosting EPO drug, the IOC said. 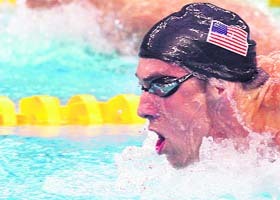 Phelps is counting off the golds in world records as he bids to surpass Mark Spitz's record of seven golds in 1972. Again watched by U.S. President George Bush in the Water Cube, he left the Americans second after the first leg, trailing to a French team who had vowed to "smash" them. With just a lap to go, France's former record holder Alain Bernard led by half a body length, but an astonishing comeback from Jason Lezak took the gold by a finger-tip. "Jason finished that race better than we could even ask for," Phelps said. "I was so fired up." 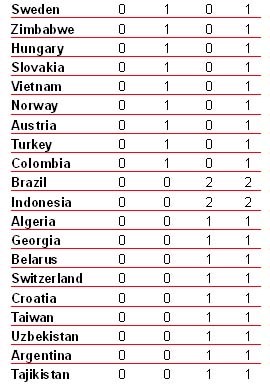 The Americans took nearly four seconds off the world record, a big margin in swimming. In all, five relay teams beat it, while Eamon Sullivan claimed the individual world record from Bernard when he led the Australian team off on the first lap. So the inevitable has occurred. India capitulated by eight wickets in the third test against Sri Lanka to yield the series 2-1. 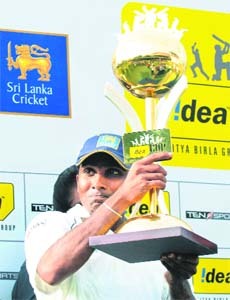 It highlighted that Sri Lanka, who have never won a Test in India, remain a force to be reckoned with at home. Indeed, they haven’t lost a Test battle on their soil since 2004. India’s second innings total of 268 presented the hosts an unintimidating target of 122 to win. They lost two wickets for 22 - Michael Vandort bowled by Harbhajan Singh, who took the new ball in Ishant Sharma’s absence, and Kumar Sangakkara, otherwise man of the match, duped by the bounce of a Zaheer Khan delivery to hole out at midoff. But an unseparated century stand between Malinda Warnapura and skipper Mahela Jayawardene ensured they reached their destination in style. This was India’s second defeat in three appearances at the tree-rimmed Sara Oval - the first being in the inaugural tour of 1985. And with it, they have succumbed in their last two visits, having won only in 1993. The writing was unmistakeably on the wall at stumps on the third day, with Rahul Dravid and an injured VVS Laxman the only real obstacles in the path of Sri Lanka’s progress. The fact is, on a wicket where only the occasional ball misbehaved, their sixth wicket association - which toted up 85 runs - signified there were few demons in the pitch if one batted in consonance with Test requirements. Before the southern stars emerged from the tin-roofed clubhouse to resume the Indian venture, had arrived the delightful news in the Indian dressing room that Chandigarh’s Abhinav Bindra had won India’s first ever individual Olympic gold medal. For an hour and 35 minutes, Dravid and Laxman, whether inspired by this feat, batted with few alarms. But inexorably, a wicket-taking ball erupted to trigger Dravid’s downfall. Man of the series Ajantha Mendis, a thorn in India’s flesh throughout the encounters - who has scooped a world record tally of 26 wickets in a three Test interface on debut - went around the wicket to turn and bounce one disconcertingly and elicit an outside edge to slip, which reflected his third wicket of the innings and eighth of the match. The Bangalore run-machine’s 68 was his sole half century of the series. Among India’s specialist batsmen, he patently experienced the most difficulty against the bewildering Armyman; but characteristically ground his way out of the discomfort - even cover driving and square cutting his tormentor with confidence. His contribution, though, was inadequate to avoid an Indian defeat. His cohort Laxman’s rarefied talent is sometimes his undoing, for he ventures into shots others don’t contemplate. But constrained by a painfully sprained ankle, he was compelled to restrict his extravagance. Indeed, a conservative VVS simply could not be dislodged. Balancing on his right leg, he hooked Dhammika Prasad to the hoardings at square leg. Then, with minimal use of his feet, he drove this paceman “on the up” to the extra cover billboards. He remained unconquered after he ran out of partners. Inconsistency was the bottomline in India’s showing in the series. Undertaking the tour after either six weeks of the Twenty20 Indian Premier League or a month of 50-50 or both, they were mentally unprepared for the engagement; and one warm-up game was, in the circumstances, insufficient orientation. But it’s in physical readiness that they were most wanting. The spectacular run out of Zaheer by Thilan Samaraweera, after he had misfielded the ball in the midoff region and yet electrifyingly recovered to shatter the stumps at the non-striker’s end while still on his knees, underlined the gulf between the sides. Even after the warning signal in the first Test, the BCCI - in complete disregard of national interest - were pursuing a money grabbing T20 Champions League tournament, which would have finished a day before the start of India’s opening Test against world champions Australia in October. Bowling: Zaheer 6-1-22-1, Harbhajan 14-2-44-1, Kumble 10-2-34-0, Sehwag 3-0-12-0, Ganguly 0.1-0-4-0. A two-day fitness camp for the Lanka-bound India's ODI team began at the M Chinnaswamy stadium here with skipper Mahendra Singh Dhoni and four others attending the session. Other players who will be participating in the short camp are Yuvraj Singh, Irfan Pathan, Suresh Raina, Virat Kholi and Praveen Kumar. The players who assembled at the stadium in the morning had net practice and underwent fitness training. Sachin Tendulkar, who injured his left elbow during the third Test, was today ruled out of the five-match one-day series against Sri Lanka and replaced by Tamil Nadu batsman S. Badrinath. "Tendulkar has been ruled out of action for two to three weeks. He would be replaced by Badrianth," according to a team sources here. Kevin Pietersen celebrated his first Test as England captain with a consolation six-wicket victory over South Africa in the fourth and final Test on Monday. Andrew Flintoff (11 not out) hit the winning runs with a straight six as he and Paul Collingwood (25 not out) steered the home side to 198 for four. Bowling: Morkel 13-2-43-0, Ntini 14-4-55-2, Harris 19.5-5-56-2, Nel 5-0-21-0, Kallis 1-0-10-0. Hosts India will take on defending champions Tajikistan in the title clash. India, who beat Myanmar in the semifinal, thanks to striker Sunil Chetri’s 82nd minute header, will face tough competition from Tajikistan, who had overcome a nine-man North Korea.